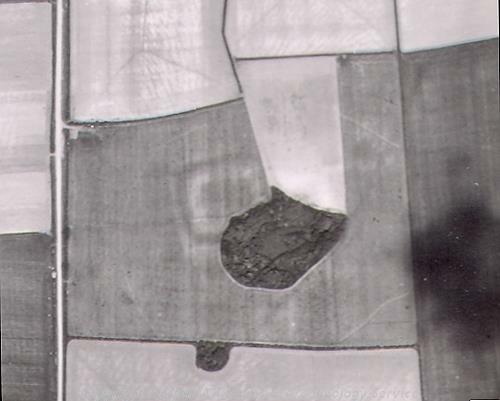 The cropmark remains of an Iron Age/Romano-British fort (possible signal station) are clearly visible on the aerial photographs (examples of which are CUCAP 1959 and RAF 1946 images). The area of these remains seems to be within the confines of an enclosure, of which only 2 sides appear to be complete (the north and west sides). In the northeast area of the site (outside the fort, but within the enclosure) there are other cropmarks to be seen including linearfeatures and a possible ring ditch/hut circle). Excavations in the 1950s and 1960s revealed that the enclosure was constructed in the 1st century AD, and it appears to post-date the Roman invasion of AD 43 although it was probably the product of native planning rather than Roman construction. Several shallow graves containing human skeletons were found within the enclosure indicating that the site was re-used as a cemetery in the Early to Middle Saxon period. The NAU carried out an archaeological evaluation on the site in 1996 but no finds or features were recovered. Aerial photograph discovery of Iron Age/Roman fort, suggested signal station. Roman sherds, tile, coins found. Full excavation revealed an Early Saxon/Middle Saxon inhumation cemetery within the Roman signal station. Approximately half the burials contained graves goods which include iron knives, small buckles, a silvered escutcheon from a hanging-bowl, and a bronze disc with animal interlace. Beaker pottery was also recovered. Further excavation in 1960, on the Anglo-Saxon cemetery brought the number of graves known up to 24. See (S6) for short summary and information from (S7). M.Langham-Lopez (HES), 22 February 2013. Evaluation of adjacent plot proved negative. See full details (S5), schedule, plans, press cuttings in file. E. Rose (NLA), 13 November 1996. 19 June 1995. NLA air photography. H. Clare (NLA), 18 April 2001. The cropmark remains of the Iron Age/Roman fort (possible signal station) are clearly visible on the aerial photographs (two examples of which are CUCAP 1959 (S1) and RAF1946 (S2) aerial photographs). These are centred on NGR TF7253 4255. They take the form of a possibly sunken/ditched area in the centre with a bank around it and a ditch around that. The dimensions of the site are approximately 85m by 70m. It is possible that the central area is not sunken at all and just gives the appearance of this in comparison to the colouring of the bank cropmark around it. The area of these remains seems to be within the confines of an enclosure, of which only 2 sides appear to be complete (the north and west sides). The north side runs from TF7264 4267 to TF7247 4260 and is ca. 190m long. The west side runs from TF7247 4260 to TF7250 4248 and is about 135m long. There is also a short length of a third side that runs from TF7250 4248 to TF7253 4248; at this point it appears to abut the wooded earthwork/embankment (which is plotted on both the current OS map (S3) and the 2nd edition (S4)). In the NE area of the site (outside the fort, but within the enclosure) there are other possible cropmarks that can be seen (linears and a possible ring ditch/hut circle?) forming some sort of complex (centred on TF7263 4261). However these are only visible on the CUCAP images from 1959 (S1). (It is possible that some of these features might be at least a part of the site previously recorded under NHER 1340. However, the photograph and features noted as NHER1340 were not entirely apparent). H. Clare (NMP), 29 April 2002. July - August 2007. Metal detecting. A. Rogerson (NLA), 1 September 2007. Articles [Eastern Daily Press, 1950,1952, 1952,1952] missing from file. [J Yates, 19 July 2010]. --- Aerial Photograph: Edwards, D.A. (NLA). TF 7242E,F,AC-AF. --- Article in serial: Clarke, R. R. 1957. Norfolk Research Committee Excavations 1956. Norfolk Research Committee Bulletin. Series 1 No 9 (for 1956) p 1. --- Aerial Photograph: Edwards, D.A. (NLA). 1995. TF 7242AG - AH. --- Article in monograph: Gregory, T. 1986. Enclosures of 'Thornham' Type in Norfolk. Excavations at Thornham, Warham, Wighton and Caistor St. Edmund, Norfolk. Gregory, T. and Gurney, D.. EAA No 30 pp 32-35. --- Newspaper Article: Eastern Daily Press. 1952. 12 September. --- Newspaper Article: Eastern Daily Press. 1952. 27 October. --- Newspaper Article: Eastern Daily Press. 1952. 19 September. --- Newspaper Article: Eastern Daily Press. 1950. 20 December. --- Newspaper Article: Eastern Daily Press. 1952. Thornham find may be Roman Signal Station.. Unknown..
--- Newspaper Article: The Country Scene. 1975. A mixed bag.. 20 December. --- Article in monograph: Gregory, T. 1986. An Enclosure of the First Century AD at Thornham. Excavations at Thornham, Warham, Wighton and Caistor St. Edmund, Norfolk. Gregory, T. and Gurney, D.. EAA No 30 pp 1-13. --- Archive: Clarke, R. R. and NCM Staff. 1933-1973. Norwich Castle Museum Record Card - Neolithic. Thornham. --- Archive: Clarke, R. R. and NCM Staff. 1933-1973. Norwich Castle Museum Record Card - Iron Age. Thornham. --- Archive: Clarke, R. R. and NCM Staff. 1933-1973. Norwich Castle Museum Record Card - Roman. Thornham . --- Archive: Clarke, R. R. and NCM Staff. 1933-1973. Norwich Castle Museum Record Card - Early Saxon. Thornham. --- Archive: Clarke, R. R. and NCM Staff. 1933-1973. Norwich Castle Museum Record Card - Late Saxon. Thornham . --- Archive: Clarke, R. R. and NCM Staff. 1933-1973. Norwich Castle Museum Record Card - Medieval. Thornage . --- Article in serial: Clarke, R. R. 1956. Norfolk Research Committee Excavations, 1955. Norfolk Research Committee Bulletin. Series 1 No 8 (for 1955) p 1. --- Article in serial: 1961. Norfolk Research Committee Excavation, 1960. Norfolk Research Committee Bulletin. Series 1 No 13 (for 1960) p 1. <S1> Oblique Aerial Photograph: CUCAP. 1959. NHER TF 7242AM (CUCAP XU71) 13-APR-1959. <S2> Aerial Photograph: RAF. 1946. RAF 106G/UK/1571 3047 07-JUN-1946 (Norfolk SMR TF 7242A). <S3> Map: Ordnance Survey. 2000. Ordnance Survey 1:10000 (revised 2000). <S4> Map: Ordnance Survey. 1902-7. OS 25" 2nd edition (1902-7) sheet VI.3. <S5> Unpublished document: Forrest, K.. 1996. NAU Report. Pre-determination Archaeological Evaluation. Lyng Farm, Thornham, Norfolk..
<S6> Article in serial: Wilson, D. M. and Hurst, J. G. 1958. Medieval Britain in 1956. Medieval Archaeology. Vol I (for 1957) pp 147-171. p 148. <S7> Article in serial: Wilson, D. M. and Hurst, D. G. 1962. Medieval Britain in 1960. Medieval Archaeology. Vol IV (for 1961) pp 309-339. p 309.